On June 6, the Syrian Democratic Forces (SDF), mainly consisting of the Kurdish formations, began an active phase of the operation to liberate Raqqa from ISIS terrorists. This was announced by the official spokesperson of the Syrian Democratic Forces (SDF), Talal Silo, in his interview to AFP. He also stressed that the Kurdish forces have already entered the city of Raqqa from the eastern district of Al-Meshleb. It also should be mentioned that the SDF are supported by the US-led coalition. However, in fact, the real fight against terrorists is carried out only by the Kurdish forces. The U.S. Air Force often conducts indiscriminate air strikes not against terrorists, but against civilians in Raqqa. According to many Syrian experts, there are only two ways for the development of the operation in Raqqa. First, it is assumed that taking the city won’t only weaken the positions of ISIS terrorists, but will also strengthen the U.S. influence in Syria. According to experts, if Raqqa was liberated by the U.S.-backed SDS, the Kurdish units, using the patronage of Washington, would unlikely to return to their former positions. Besides, it is unlikely to be well received in Damascus. Subsequently, such a scenario, obviously, will cause new clashes and escalate the situation in the country. Second, Turkey strongly objects to the involvement of a Syrian Kurdish group in any military operations in Syria. In addition, the U.S. support of Kurds is an extremely sensitive issue for Turkey. The Kurdish Democratic Union Party (PYD) is considered by the Turks as a terrorist group. In addition, Ankara is worried that if Kurds succeed in Raqqa, they would activate an anti-government movement on the Turkish territory. In this regard, Turkish Prime Minister, Binali Yildirim, claimed that Ankara reserved the right to an immediate response if the operation in Raqqa posed a threat to Turkey. Thus, it is obvious that both of these scenarios will lead operation in Raqqa to the scenario of Mosul. It also can turn into another hotbed of tension. A similar result can be preceded by two scenarios. 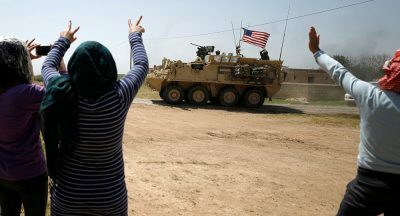 At the same time, it is possible that afterwards the U.S. simply can abandon its earlier promises to the Kurdish side, which conscientiously fights against terrorists. Washington has never taken the steps that would be contrary to its interests.